The very popular Camp Sail date is the 14th June (which is a change from the date originally set in the yearbook.) This was to accommodate the Annual 60th Birthday Anniversary Party on the 19th July and to ensure you all had an opportunity to come to both events if you can. Camp Sail starts at 2.00pm and tickets will be on sale soon! There is a list at the Sailing Club for those of you who are planning to come – Please do add your name to the list asap so we can plan for the evening BBQ and bacon sandwiches for the happy campers! Despite the very strong winds several pinkies arrived hoping for a race…..Monica cooked the breakfast, Dean got the safety boats out, but only 2 brave souls took to the water, Ian in his RS Vision, crewed by Mark. 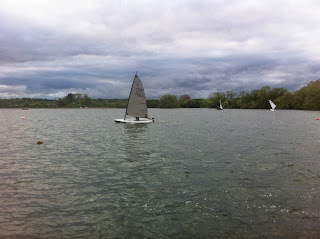 Gary tried to rig his Laser, but could not get his mast up in the strong breeze so gave up. Once everyone was safely ashore and warmed up, it was agreed by all that it had been a good practice session for rescuing a ‘stuc’k boat – while Ian and Mark had enjoyed their sail / survival!!! The wind dropped slightly so Gary and Carole ventured out to watch over Louis and Ryhs in their Topper, after getting stuck in the trees they then enjoyed a great sail. The other hardy Pirates went out in the safety boats and had fun with a surf board close to the slipway. Our commodore gave us a splendid exhibition in Grace’s Topper, as did Gay in his….!!! But the highlight of the day was undoubtedly the arrival of Tracey’s new Comet Walter, all bright and shiny…..a very excited Tracey watched it being put together, but she decided to wait for a calmer day to launch it for the first time with a bottle of bubbly! The weather forecast was definitely correct this evening with gusts of up to 26 mph forecasted and consequently only a few took to the water after long discussions about which sails to use. The spectators were freezing on the jetty waiting for the spectacular capsizes to come. But apart from one capsize everyone was happily whizzing around the course. It was probably warmer sailing out there than watching from the jetty! Reading Sailing Club 60th Anniversary Party is open to all members and friends. The party is all inclusive, we are hoping to involve everyone from all aspects of the club … Racers, families and the model boaters too. Tickets are available from me (Laura Johnson) or Sally Newlove priced at £7.50 for adults and £5.00. See link below – also on Homepage.